Saudi Arabia's King Abdullah attends a cabinet meeting in Riyadh, March 24, 2008. The mother of the mother of Islamic states, the Kingdom of Saudi Arabia, has made waves in 2008. 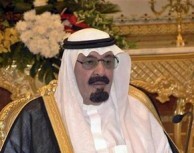 His Royal Highness King Abdullah, the wise ruler, has revitalized the old traditional conservative path and truth of tolerance of Prophet Mohammad (pbuh), who founded the two Holy Mosques in Mecca and Medina where King Abdullah is the Custodian, and the Prophet several times had invited Christians there to join him in the Mosques for prayers to their one Allah, the Arabic word for God used there by Muslims and Christians. The King steped by this into the footsteps of the Prophet starting in 2007 and very actively in 2008. He became by this the number one true Muslim preacher, the defender of the true teachings of the Prophet and Islam and the dominant beacon of an Islamic Renaissance. He is the moral custodian of the Mosques and cleaned Islamic teaching from the thick dust of wrong interpretations by radicals which had turned the preaching of the Prophet upside down. In November 2008 be sponsered a two-day conference at the United Nations in New York. His aim: to promote dialogue between the religions of the world and to improve the image of Islam as religion that favors dialugue over violence. He said: " Human beeings are created equal as partners on this planet. Either they can live together in peace and harmony of they will inevitably be consumed by the flames of misunderstanding, malice and hatred. The time has come to unite together on moral values. Terrorists are enemies of God and enemies of every religion and culture and would not have appeared in the presence of tolerance." In 2007 he met Pope Benedikt XVI at the Vatican, the first historical meeting of any Pope with a ruler of Saudi Arabia. In 2008 be arranged a conference of Muslim leaders at the holy city of Mecca and in July presidented over a gathering of Muslims, Christians, Jews, Hindus and Buddists co-hosted by the King of Spain in Madrid.